What Do You Want To Know About The Jaguar F-Type SVR? Mark my words, the Jaguar F-Type is historically significant. Even if it’s only remembered as the body that made Jaguar growl again, that’s a damn decent legacy. But speaking of sound, this week we’re running the loudest-roaring Jag I’ve ever stood near around Los Angeles this week, so let us know what you want a closer look at. This particular Caldera Red F-Type SVR hardtop is literally one week from retirement. I’ve been told by my contacts at Jaguar that it’s being pulled out of loaner duty the second I give it back, so consider this the last chance to tell your friendly neighborhood car blogger where he should poke and prod the thing. 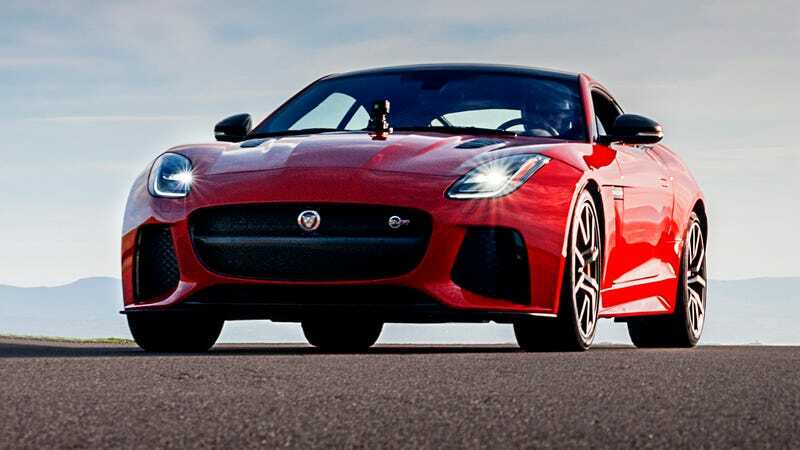 The F-Type SVR has a $120,000 price tag, 567-horsepower (575 metric horsepower, the way Jaguar prints it) engine and 3,700-pound curb weight but the vehicle’s primary value proposition seems to be its exhaust note. At idle, it sounds like a Doberman Pinscher that thinks you’re eyeing its dinner. A heavy-footed parking lot exit sounds like satan singing lead vocals for Mudvayne. Full-power through a tunnel, well, I haven’t worked up the courage for that yet. You can probably find the answer to all your questions about weights and dimensions on Jaguar’s spec site, but for everything else, let me know what you want to know and I’ll let you know... what I can find.